Toys today just aren’t like they used to be. There was a time when an Erector Set was considered a fun educational toy helping future engineers and builders learn the basics of mechanics and building. Nowadays, kids are raised on computers and have learning toys most adults can’t operate without a manual and a degree in a foreign language. According to a Kickstarter campaign, two sisters have come up with an exciting toy for kids that can help them become the future coders and robotics designers of the world. It’s called PHIRO, and your little science geek can use it to get ahead of the rest of the class. As educational toys go, PHIRO is a small robotic toy that helps children learn problem-solving skills, computational thinking, robotics and coding, according to Robotix, the learning solution company behind it. From the video, what it reminds you of is a modem on wheels, or a slightly scaled down Roomba whipping around, or maybe even a space age Tonka truck once the front loader is installed. That’s because you can customize the robot with Legos to expand on its uses. It’s actually pretty cool, and you don’t have to be a nerd to appreciate it. Once you’re through altering its appearance and turning it into a front loader with Legos, the PHIRO can be programed with a pocket code through a smartphone, which most little kids seem to have already, or what are called Swish Cards, that basically amount to the same action as swiping a credit card. There’s also an interactive programming feature for use with laptops or tablets called Scratch. And, if that weren’t enough, it’s got a smartphone mount that allows users to perform a number of functions, including making a video with face detection. Speaking of Roomba, the PHIRO robotic device has the same kind of obstacle avoidance technology built into it as the little iRobot sweeper. The interactive features allow kids to create things like stories and games that will help them eventually develop future applications with an outside-the box view to things. It also provides kids with five ways to learn coding, a job that is already in high demand. Coding makes just about everything we use now run. It’s essentially a language that needs to be written for things like operating systems, software, websites and apps. If it’s a smart device, it’s got coding. 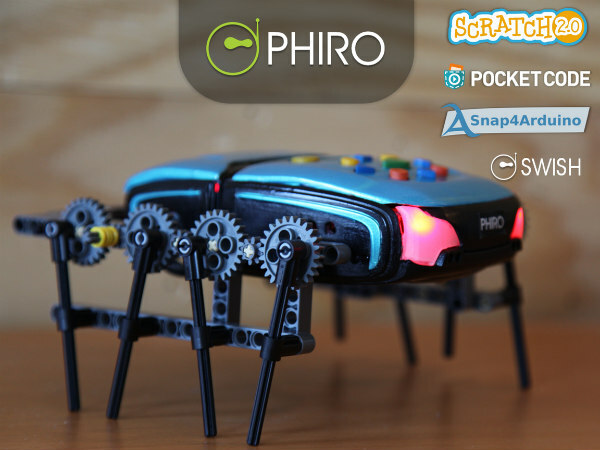 PHIRO uses open source languages from MIT, UC Berkley and Graz University of Technology. As we move increasingly towards a technological society, the skills kids will need are obviously going to be much more complex than prior generations’. Not only will they be faced with scientific problems that need solving but most of the jobs of the future will be technical in nature. Learning devices like this can help develop the skills to solve new and existing problems in half the time for a fraction of the cost. Kids are already doing it. They’re coming up with innovations for technology already in existence more affordably and with less of a negative impact on the planet, and they’re doing it because they want to help, not to get rich or famous. Robotix is currently looking for people to help them bring this interactive learning toy to children all over the world. After playing with it, your kids ought to be rocket scientists by the time they grow up. Who knows, they may solve world hunger before they’re 18. Now, wouldn’t that be nice. New BraDryer To Be Customized To Your Bra Size! Kit Kat & Strawberry McFlurry? Gimme A Break!